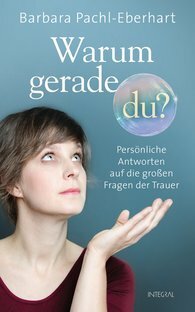 Original Title: Warum gerade du? Hardcover with jacket, 12.5 x 20.0 cm, 4.9 x 7.9 in. Why did you have to die? Why doesn’t the pain stop? Will I ever be happy again? … The large existential questions of mourning – Barbara Pachl-Eberhart had to pose these to herself and find her own answers to them. When she lost her husband and both of her children in an accident, her life suddenly stood still. Today, six years later, she is a woman who, because of this extreme experience, is able to pass on her wisdom and impart a healing, compassionate strength. Her new book is a treasure for all in mourning and for those around them. Written from an immeasurable depth of experience, this book can be a source of comfort and new confidence.